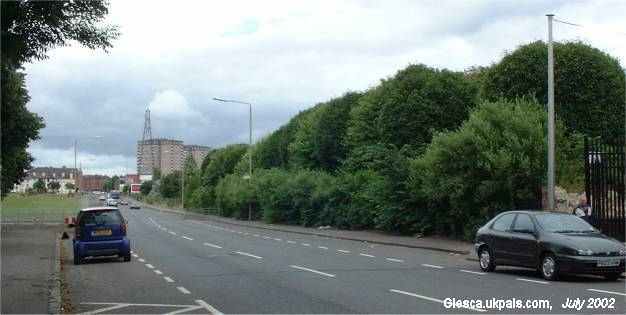 the trees to the right is where Riverside Secondary School used to be..
Celtic Park's new stand ( Rangers End ) can be seen. Springfield Road diagonally opposite the old Riverside School, this is what we used to call the Daisy Park. In my day there was railings circumferencing the park and my Ma use to bring my sisters and I with a shawl to sit on and have a picnic or run around with a ball. There was a few parks known locally as Daisy Parks, to do with the profusion of daisies peeping through the grass. The yellow dandelions were known as pee-the-beds. and who am I to argue! How is everybody, you have a fascinating web page as it brings back memories of growing up in Springfield Rd just opposite the wire works. Went London Road school then Riverside school, then moved onto New Zealand, worked there in an office for 20 years, in meat export business, which took me all around the world, including brief visits back to Parkhead. Business posted me to Tokyo for almost 3 years. Married in 1960 to Margaret Comrie from Tillicoultry near Stirling. All my Glasgow upbringing and education helped me to succeed beyond my expectations. With that in hand, was offered a job in USA, Minneapolis, then Kansas then Atlanta until retirement to Denver Colorado in 1998, what a fabulous life , all owed to Parkhead days. Been back many times and sad to see the houses now pulled down for 2014 Commonwealth Games. We were the first in the new hooses in 1935. Went many times to Celtic Park (altho a Rangers supporter ), lifted over the bar, then worked with a neighbour Freddy Martin, who had a barrow to sell Honey pears at Celtic Park and Ibrox, so the best of all worlds. Would like to hear from people who went to school in the 40's to see if we can recapture some the times and find someone I know.